**Please Help - Unable To Bind Webserver To Interface Problem** — . :: GSA SEO & Marketing Forum ::. 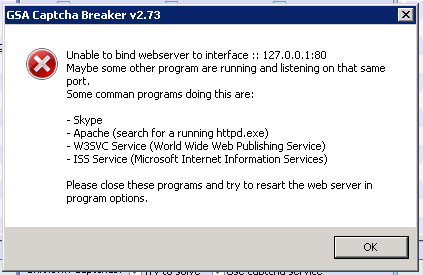 I've read the documentation provided here: http://docu.gsa-online.de/captcha_breaker/webserver_error, but since I am running Captcha Breaker on a Windows VPS, I do not have the option to disable IIS because that feature isnt even enabled on the server. Could you guys please help me do what needs to be done to stop this error? Are you running it with SER? If so, you don't have to use the "run as webserver" option. They can communicate automatically by setting SER to use CB. No, im not running it with SER at the moment, im running it with another program (Zennoposter).